Cook the Books meets Food ‘n’ Flix in the arena of “Home Cooking” here at Can’t Believe We Ate… The character Minny, from the movie The Help, our movie selection of the month, has quite the reputation in town as a cook. One of her specialties is fried chicken. 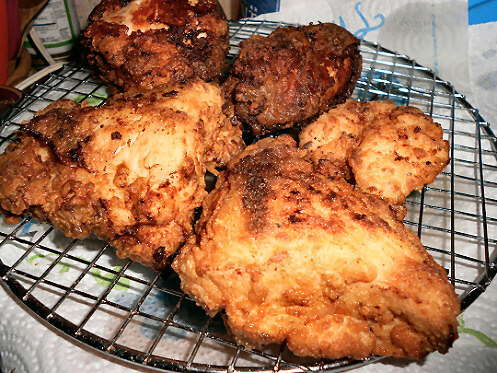 Interestingly enough, Laurie Colwin gives us her recipe and method for frying chicken in her book, our current Cook the Books selection, Home Cooking. We’ll end up having a little comparison here before we’re finished. 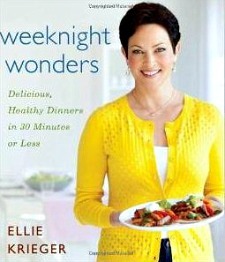 Aside from cooking, this book and movie couldn’t be farther apart! Laurie Colwin’s Home Cooking is a collection of short food essays full of reminiscences. 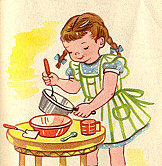 Ms. Colwin delights her readers with her real-life recollections of various foods along with recipes or techniques. I was actually inspired to make roast beef when I first read the book in March, yet fried chicken called out to me when I re-read the book in August. My family is particularly fond of my fried chicken, however, I’m usually willing to try a new technique. I didn’t think there would be all that much difference. I’m sorry that Minny didn’t share any of her recipes with us. We do get some left-handed cooking lessons from her as she “teaches” her mistress, Celia Foote, how to cook. Personally, I’d love to have the recipe for Minny’s Caramel Cake. That has me puzzled and intrigued…there are so many ways one could go about creating such a decadence. But we’re frying chicken…so let’s get back to it. Ms. Colwin and I agree that chicken benefits from a buttermilk bath. She recommends soaking the chicken in plain buttermilk, and that’s where we start to differ. I almost always brine my chicken because most chicken has no flavor. Add some salt, garlic and onion powder to the buttermilk and soak away. Soak or marinate the chicken for at least 45 minutes. If you created a buttermilk “brine” 45 minutes will probably be enough. However, gently salting the buttermilk and seasonings will make a great overnight bath for the chicken. Breading the chicken is next. So far, Ms. Colwin and I are right on track… Season your flour the way you want your chicken to taste when it’s done. Taste the flour to get it right. It will taste a little, well…floury, but it’s the balance of salt and other flavorings that you want to work on. I use salt, garlic powder-granules, onion powder, and freshly ground pepper for my base. It’s kind of my universal seasoning. Sometimes, especially for chicken, I add paprika…or smoked paprika…Yummmm! When the flour is the way you think you’ll like it, put it either in a bag (for shaking) or a shallow dish. 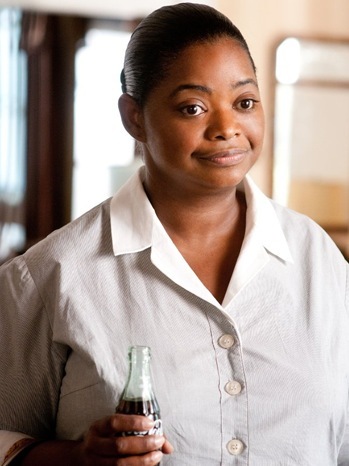 Ms. Colwin and I will depart a bit here… Ms. Colwin breads her chicken straight from the buttermilk. Shaking off the excess milk, she drops the wet chicken pieces into a bag and flours them generously. Knock off the excess flour, and set aside for a moment until you have enough prepared pieces to fill your pan without crowding it. What kind of pan? A chicken fryer… There really is such a beastie. It’s a good sized (12 inch or so) straight sided frying pan with a lid. The best pan, bar none, and Ms. Colwin and I are in lock-step on this one, is a cast iron chicken fryer with a heavy lid. I inherited mine from my mother, who prepared chicken precisely by Ms. Colwin’s method, religiously…until I brought boys home from church for Sunday dinner. Out of nowhere, she served up a platter of the crispiest, crunchiest lightly crusted chicken I’d ever seen. I was amazed and delighted!! She never fixed chicken that way just for us…I brought the guys home for dinner a lot after that! Ms. Colwin prefers a steam-frying method for cooking her chicken…she has you place a tight lid on the chicken and turn the chicken twice before removing the lid to finish the cooking. I followed the technique, but found I over-cooked my chicken that way. 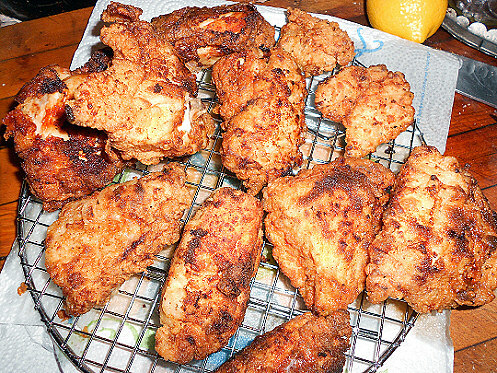 From the first pan on, I open-fried the chicken, as in the picture below. 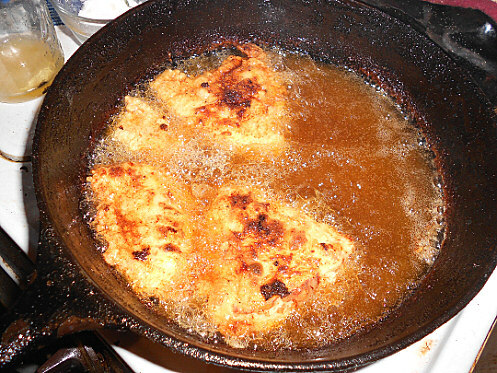 I think this was the last pan full of chicken I cooked…using the single breading method. I had a rather large package of boneless, skinless chicken half-breasts that needed to be cooked. Having a plate of fried chicken got me past a lot of obstacles this week, and I was glad for it! One distinct difference I noticed between Ms. Colwin’s method and mine, is that she’s right…the crust on her chicken gets soft once it’s refrigerated. Mine, however, doesn’t. We still have crunchy chicken the following day, and if I let it cool really well before packing it into the fridge, it’s crunchy for a couple of days. We enjoyed this batch of fried chicken with potato salad. I’m not saying mine is better than hers…I’m saying it’s two different methods with two different outcomes, and one should expect two different results. So far, I’ve mainly chattered on about Ms. Colwin’s chicken, so now it’s time to give The Help a chance in the spotlight! I’m the hostess at Food ‘n’ Flix this month, and I chose this movie. Next month we’ll be watching a different movie…check my sidebar for “Coming in September” to see what’s next. 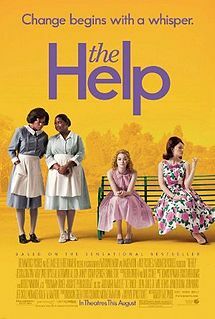 I thoroughly enjoyed this movie, with all it’s side stories and surreptitious meetings, spilling the secrets of the society ladies… It’s hard for today’s youth to imagine the segregation and disparate treatment of anyone with a non-white skin. Prejudice wasn’t known as such…it was more an accepted way of life…then. While the storyline pretty much sticks to the lighter side of life around the southern plantations of the Sixties, it touches reality deeply in places. I love Skeeter’s independence and verve. I loved the depth of caring and empathy exhibited by Abileen…and I couldn’t possibly dislike Miss Hilly any more! 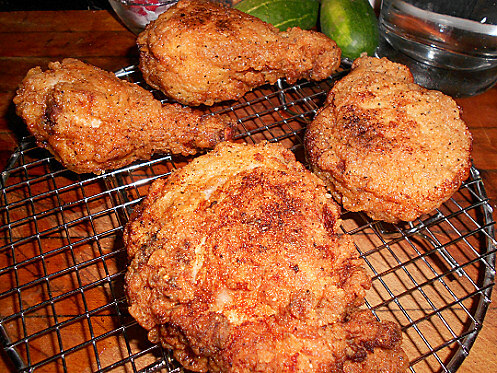 Southern cooking screams fried chicken to me…well, and a few dozen other things too, but chicken gets there first. What I’d give to have a cook like Minny around! Not to work for me!! Heavens no! I’d want to learn about her magical kitchen tricks! Speaking of tricks…there is one tiny detail I left out…when I mix up flour for chicken…I add a teaspoon of baking powder to it. It reacts with the buttermilk (actually, any liquid) and leavens the coating just a little bit…and that may have something to do with the lighter crispness of my chicken…but now you’re sworn to secrecy! My grandmother was a champeen chicken fryer. I never had the knack. Yours look great!